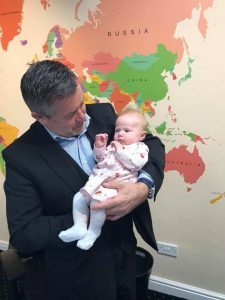 the newest member of the Spa Travel family…..baby Ivy Willow! Good luck to Lucy who leaves on 9 months Maternity Leave! 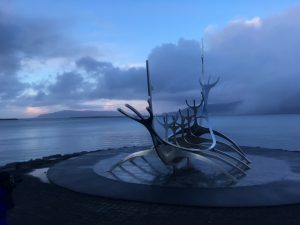 Just wanted to say thank-you for making all the arrangements for our Iceland holiday. All transfers went extremely well, only Alexis & Sam got delayed outbound bound from Bristol due to fog. The hotel was excellent, staff were very helpful, knowledgeable and nothing was too much trouble. 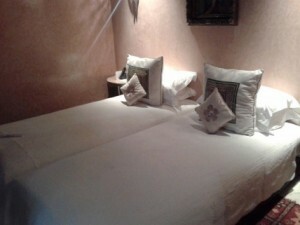 We stayed in what is known as an historic room, full of character and good facilities. The breakfast buffet covered all tastes, very extensive – we also enjoyed the hotel’s happy hour each evening. Who says you can’t drink for the same price as here? if you know what you were doing. 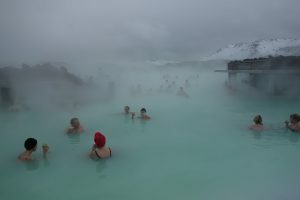 Trips were great, we particularly enjoyed the Blue Lagoon, even my husband who would never entertain going to a swimming pool ever, even abroad, let alone outdoors in sub zero temperatures! 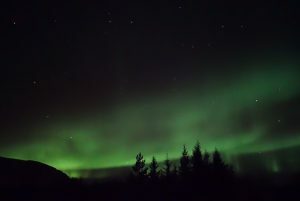 We were also extremely lucky to see the Northern Lights. A truly once in a lifetime experience! 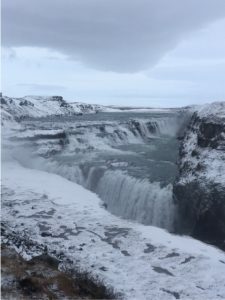 From start to finish the holiday was amazing and enjoyable, stress free, we would definitely recommend this package to anyone else wishing to visit Iceland and to book with you! 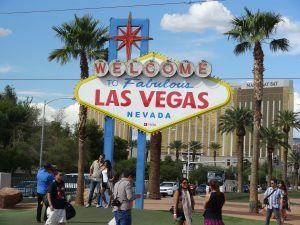 “Wow – another great trip! Thank you for arranging everything for our holiday to Iceland. 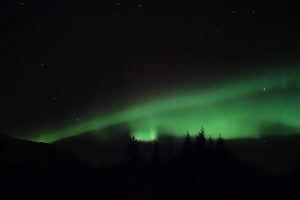 Everything went smoothly, all the trips, transfers and hotel were fabulous (and we even saw the Northern Lights – fantastic). Thanks Paul for also co-ordinating the 3 different parties from two different locations and 3 different lots of hotel room accommodation, we had a lovely two bed apartment in the hotel and the breakfast was delicious. So once again, thank you so much Lucy & Paul, we would highly recommend all of the trip to anyone and couldn’t fault it. 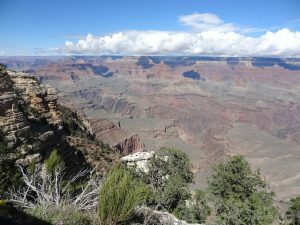 I have worked in travel for nearly 10 years & I love working on American itineraries. I have wanted to visit the USA for a long time so was thrilled when I won a place on USAirtours & NCL Florida cruise & stay trip. 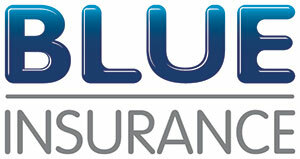 There were 8 agents from shops all over the UK, Jessie & Sharon from USAirtours & Neal from NCL. 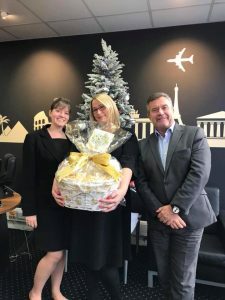 We met at Gatwick & flew out with Norwegian airlines who have launched some new routes from the UK this year. As an airline Norwegian were very impressive, we flew on the 787 Dreamliner and there was good seat back entertainment and the crew were lovely. The seat pitch in economy is 32” so pretty standard, although as the fares are so cheap if budget will allow I would definitely recommend Premium. The food on board was not great but I don’t think many are. The downside was having to pay on board for drinks and snacks whereas usually on long haul flights you would get these included with the fare. However, their fares are extremely competitive. Fort Lauderdale airport was slightly chaotic when we arrived & getting through security and Immigration was not the speediest of processes, however once we had got through and reclaimed our luggage we got a taxi to our hotel in Miami & arrived by 10pm. This hotel s what you would typically expect of a brand such as Lowes. 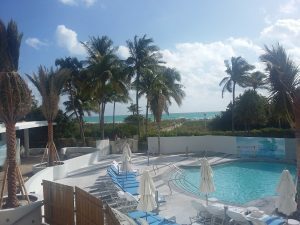 The location, right on Collins avenue is perfect & it has direct access to South Beach. The rooms were lovely & we had a side ocean view overlooking the pool which was quite nice. Tea & coffee making facilities in the room which is a plus point for the British market! We had a hosted breakfast which was amazing, the variety of food was fantastic & they even had a gluten free selection. The hotel is great for families & offers amazing facilities for parents with children to make the stay more comfortable & stress free, from baby strollers, high chairs to PlayStation for the older kids! The only negative I have about Lowes is that it is still undergoing some renovation work & even though it is in the final stages there is some noise disruption & visual disturbances so I wouldn’t want to be booking any clients here until after January 2017 when the work is due to be completed. NCL sail from Miami port which was a lot more organised than I thought it would be, we arrived by taxi so that made things much easier. Our luggage was labelled up ready for the ship & our embarkation was really quick. When you do the online check in service before your cruise which we do for all of our clients, you get a time slot where you can check in so it just makes thing that little bit easier. I have never cruised before so I didn’t really know what to expect. We had a cabin on deck 8 with a porthole window, it was at the forward of the ship & you can definitely feel the movement so I would recommend a mid-ship cabin & actually personally, I would prefer an inside cabin as I never looked out the window & the time I was in the cabin it was dark outside anyway. You can save a lot of money sometimes with an inside cabin! The Norwegian Sky is an older and smaller ship and it isn’t as modern as some of the bigger ships like Epic & Getaway but for this short sailing it was ideal. 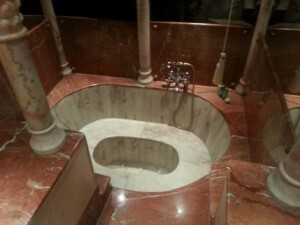 I think on longer cruise itineraries you would definitely want a more modern ship with a few more facilities on board. 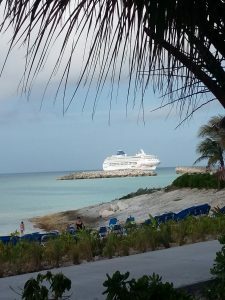 Another good thing about this itinerary is that it was all inclusive so it really does make a big difference if you are on a budget as the drinks on board are very expensive without a pre-paid drinks package. The food on board was excellent I thought. I am quite a fussy eater but I was happy with the selection available, it was very good. Most of the staff on board were friendly and helpful & we also did a behind the scenes tour where we got to meet some of the people who don’t often get recognised but the ship really wouldn’t run without them. We saw the theater backstage, the kitchens where the produce is loaded and stored on board and right at the bottom of the ship is the laundry! I’m really glad we got to do this because it just makes you realise how much goes on behind the scenes to ensure the passengers have a great holiday! There were all kinds of people on board from young to old, singles and couples. I didn’t see many families with young children though, and I did think it’s better suited to adults. We had three ports of call on the itinerary and although there are excursions available, we just did our own thing. 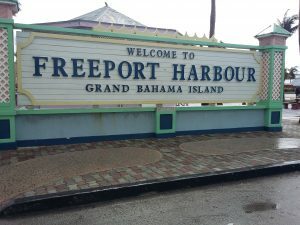 When we arrived at the first port it was raining, so a little bit disappointing but we got a taxi to the local beach which was great fun mixing with the locals, dancing & learning how to dance Bahamian style. 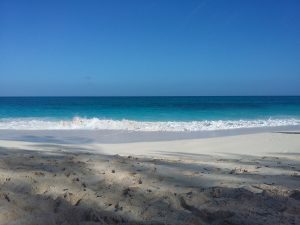 Nassau was great but we didn’t have any included excursions and I didn’t want to venture off by myself so we all headed off to the beach which was beautiful & we were quite close to Atlantis so a couple of us decided to see if we could get close enough to have a nosey. Unless you have a pass to get in you can’t get close, I think if I did this again I would book an excursion to the waterpark. 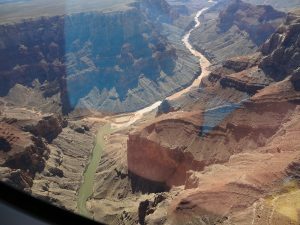 On talking to some of the other passengers on board who had done it, they said that although it was a pricey excursion – it was well worth it. This was a true paradise and I’m so glad that I had the opportunity to see it. Because of the shallow shores we had to tender which was NOT fun at all!!! It was well organised and very quick considering how many people were to get off the ship but I personally didn’t like it because of all the movement. As I said though, this was my first ever cruise and others didn’t have any issues! The island really is a paradise, we had a private cabana which is definitely worth doing because it includes the drinks & food which I can imagine being very expensive otherwise. The only thing extra to pay for was bottled water which you could just charge to your on-board account. Overall I really enjoyed the cruise, I think for the price of the 4 day sailing along with the Norwegian flights and a couple of nights pre or post cruise you could make it a really nice and not too expensive holiday. 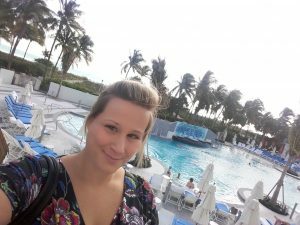 This was a lovely hotel just off Fort Lauderdale beach & close to the nightlife, so a great base to explore. Like most of the hotels in Florida they offer valet parking. There is a small rooftop pool & bathing area but you are so close to the beautiful beach you don’t really need it! The rooms were very nice and I think I got the best of them to be honest- a corner suite with amazing views looking out to the harbour. It was lovely. We did the Mai Kai dinner & show which was good fun and the food was great. They offer every cocktail you can imagine which went down a treat, but the highlight was our last night where we had dinner at Bubba Gump Shrimp which was amazing & definitely a must do for anyone staying in Fort Lauderdale. 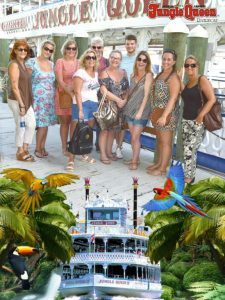 I really did enjoy this excursion; the Jungle Queen is a narrated river boat trip which travels down Fort Lauderdale’s Historic New River passing by homes of the rich and famous. The girl we had narrating was very good and she pointed out the homes of some well-known people & gave us a little bit of history as well. It takes about an hour to get to the private island where they have a few animals, mostly exotic birds plus owls and a few small monkeys. There was also an alligator show, which was pretty good but wasn’t long. You can take a picture with the Macaw for free but a picture with a baby alligator was $5, which isn’t bad. They also sell snacks, which seemed pretty reasonably priced. There are three sailings, one in the morning, one in the afternoon which is the one we did and one in the evening which includes dinner & a show. I do think this is well worth it even if you just did the afternoon tour which takes around 3 hours. Also for families this would be really great I think children would love it! We had a hosted breakfast at the Crown Plaza & site tour. It’s a really nice hotel but they are going to do a rebranding over the next year & it will become a Doubletree. There is a really big pool area and the hotel has its own riverboat stop which is quite nice for guests if they fancy a little trip along the river! This was so much fun! There are so many different types of cycle to choose from, I chose a 4 man cycle car with 3 others which was great fun! I would definitely recommend something like this to any future clients. Flamingo Gardens is a wildlife sanctuary & botanical gardens. They have all sorts of animals that have been rescued from the wild including crocodiles, all sorts of birds & even a black bear! Our guide was fantastic & you could really tell she absolutely loved her job! 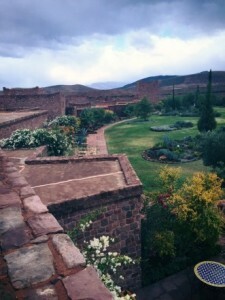 Although I did really enjoy this excursion, if time is limited it would probably not be at the top of my list. This was by far the best part of the trip for me, I didn’t know what to expect and I didn’t really think I would enjoy it at all but it was amazing… the airboat went so fast, it was such a rush and then when we got out in to the Everglades we saw 3 alligators and lots of turtles. One of the Gators swam right up to the boat literally within touching distance, what an experience……..
We also got to see the animals they have, including the baby alligators which you got the chance to hold. Oh my goodness, this really scared me! I am not the bravest of people but I did it and I’m so pleased that I did! Overall this trip was really amazing and I loved every single minute of it, in fact I can’t wait to visit Florida again. Thank you to NCL & USAirtours for your hospitality and of course the guys from the Greater Fort Lauderdale Convention & Visitors Bureau who also made our stay fantastic. 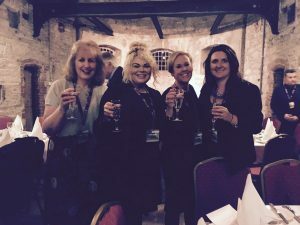 The girls from the office recently went to Cork for a conference! They spent 2 nights in Cork at the Elite Travel consortium conference spending time networking with our partner Tour Operators and other travel agents & getting up to date with all the latest news in the industry. As this is a smaller conference it was a great opportunity to network with suppliers and the girls really made good use of the opportunity, meeting lots of new people. 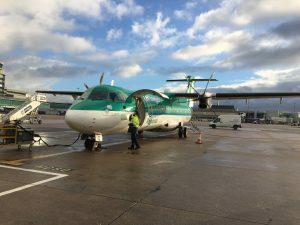 The short flight from Manchester with Aer Lingus was fabulous and the airport is only 10 minutes from the city centre so very convenient. Cork is famous for its English Market which Queen Elizabeth visited in 2014. Just an hour flight from the UK, Cork and its surrounding area is perfect for a visit for a long weekend or for longer as hiring a car and driving is very easy to do and there is plenty to see and explore! Whilst there they had an evening gala dinner at Cork Gaol which was an excellent and unique venue full of character and was the setting for their first taste of Irish music and a bit of Irish dancing as well! They had a full day of conference sessions from leaders within our industry and also a great motivational speech from the adventurist Dave Cornthwaite which was fabulous and a top tip from us would be to look Dave up on Facebook and follow his expeditions….he is currently scootering across Japan! On the second night they went into the old harbour town of Kinsale where they had dinner and experienced local produce including seafood which is what the town is most famous for – a definite recommendation! Kinsale is a historic coastal fishing village in County Cork and is very pretty with coloured buildings and great restaurants. On the final day in Cork after the last conference session they were lucky enough to visit the Titanic museum in Cobh. It teaches all about the story & history of the Titanic. Cobh was its final dock before its last journey – it was a very poignant and interesting experience and would be a recommendation for anyone visiting the area. Just an hour flight from the UK Cork and its surrounding area is perfect for a visit for a long weekend or for longer, as hiring a car and driving is very easy to do and there is plenty to see and explore! 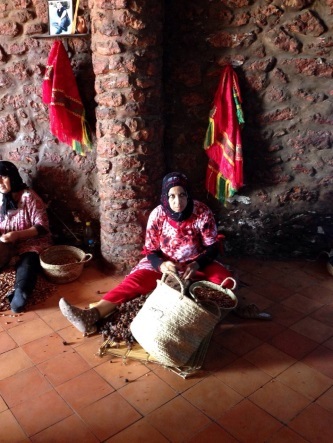 I was lucky enough to travel to Morocco in November with Anatolian Sky Holidays. 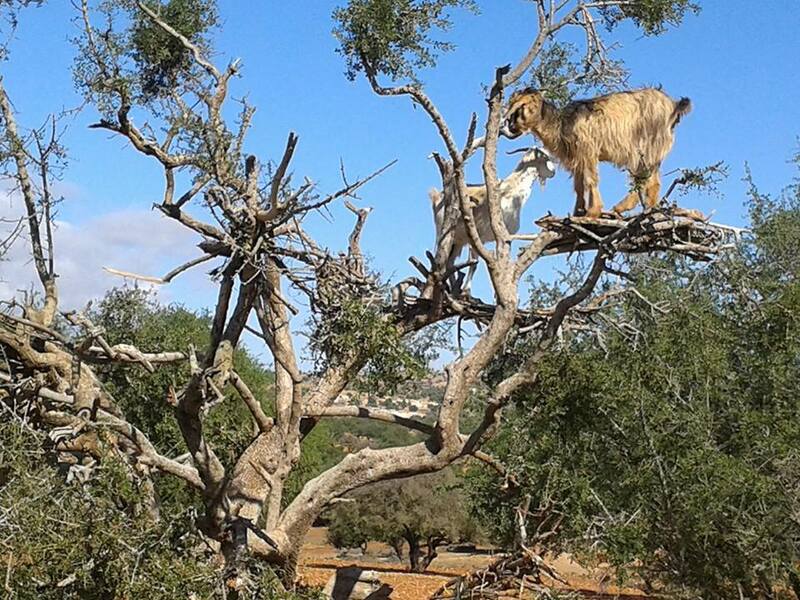 The itinerary included the Atlas Mountains, Marrakesh, Essouira & Agadir. We began in the Atlas Mountains where we saw some amazing properties & experienced real Moroccan hospitality. 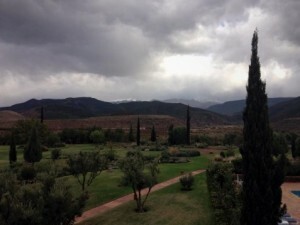 We stayed at the Capaldi Hotel & it was definitely one of my favourites throughout the trip. The owners Ed & Tara were lovely & you can tell that they look after every client with the same hospitality they showed to us. 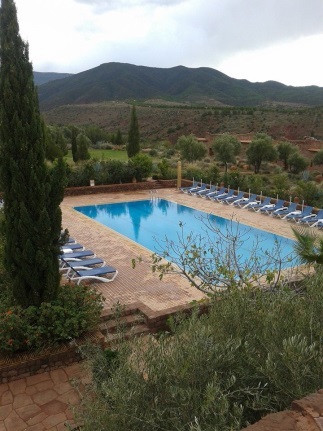 Another property I really loved in the mountains was the Kasbah Angour. What an amazing property this was & it can be easily combined with Marrakech as it’s only half an hour drive from the city. The views are just amazing & on a clear day you can see for miles. 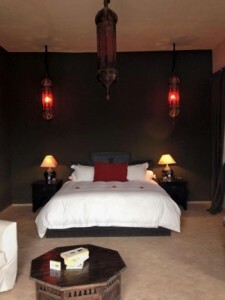 The rooms are lovely, as are the staff. The little bar area is very cosy and intimate with a great fire. On the night we stayed here there was a duet playing music & dancing. It really is a wonderful place to stay. We then moved on to Marrakech. I didn’t really know what to expect but I absolutely loved it, my pre conceptions were not at all true and I found it to be one of the most interesting places I’ve ever been! The medina is fascinating and the souks are amazing. We did a half day city tour with a guide which I would definitely recommend. On the way to Essouira we stopped at an Argon factory which was brilliant to see how it was made. Argon is used for cooking & cosmetics. 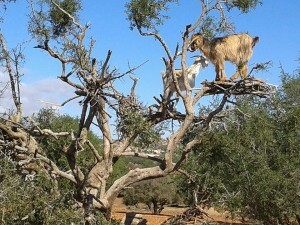 We also saw something which you would not believe unless you were there….. Goats in trees! Essouira was also a nice place to visit. I think anyone that wants a holiday with culture and possibly a combination of city, mountains & beach – Morocco is the perfect choice. Error: Error validating access token: Session has expired on Monday, 01-Apr-19 06:23:33 PDT. 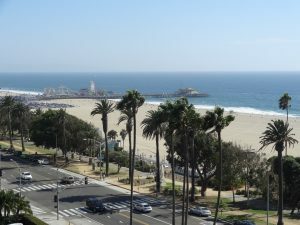 The current time is Thursday, 25-Apr-19 22:37:47 PDT.